Easy availability of smart-phones, Internet and TV is turning children into the proverbial couch potato nowadays. Instead of spending time on activities that can help their studies and career, they indulge in watching videos, social media and gaming from the confines of their home. If you are concerned about this trend and want to help your kid, take a look at some of the best fun activities we list. I am sure these extracurricular activities will help your child to excel at school and in life while giving them an edge over other kids of the age. 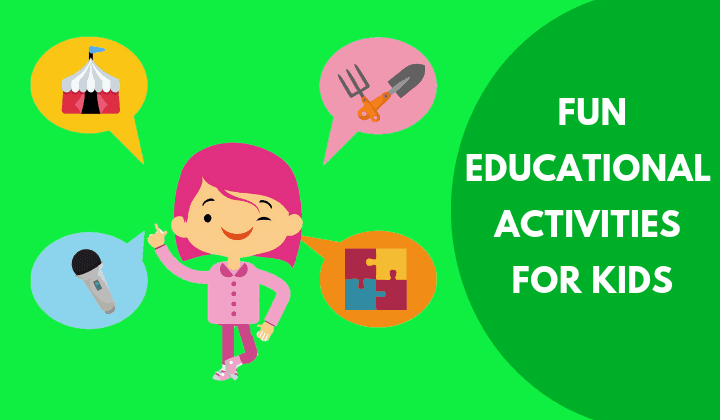 Fun activities can teach a lot of essential skills that are outside the school curriculum. These are some of the fun, educational activities for kids that can add that extra zip to your or a child’s life. Have you seen the movie Karate Kids? If so, you will be aware of how ordinary children can become experts in martial arts, defend themselves and win competitions. Karate, Taekwondo and Judo are some fun activities for kids and can be performed around the year. It is one of the best creative activities for kids. If you search online, there are several Do-It-Yourself kits for boys and girls. They teach a lot of skills such as gardening, solving puzzles, creating beautiful stuff, costume jewellery and lots of other useful stuff. They are available at reasonable rates online or at stores. Keeping a pet is the dream of every child and a fun activity for kids. Unfortunately, families living in cities may find it difficult due to restrictions on pets by housing complexes and societies. If you are fortunate to live in a place where pets are allowed, gift one to your child. It is a very pleasurable and fun activity for kids at home. Children love to collect a lot of things. Some of the best fun activities for children are collecting stamps, coins, matchbox labels and currency notes of foreign countries. Collecting items helps a child develop general knowledge. Educational toys are a fun activity to keep your child busy while enabling them to learn something new. They are relatively inexpensive and are available for children of all ages. It will help your child gain an edge over other students or before joining the school. If you are worried about how to keep your child engaged fruitfully during summer holidays, you can try some of these fun activities for kids. A lot of schools conduct summer camps for students. A variety of activities ranging from sports to educational courses, classes for increasing computer skills and religious studies feature at such thing. Thanks to widespread popularity through foreign TV serials and movies, summer camps are now also available in India. Summer camps play an essential role in a kid growth and students’ overall development. Some of these summer camps are held on various themes. It includes adventure and trekking; others aim at education. They are usually held at some distant location. Yes, younger children can also undertake specific vocational training courses. They can include mobile phone repairs, assembling electronics and basic graphic designing. Help children bring out their creativity by keeping them busy with some of these fun activities for kids. This creative activity for kids need not necessarily involve paper and glue. A child can also learn about to make a craft with waste products such as discarded PER bottles of soft drinks and water, newspapers, making useful stuff with old clothes. Origami is a Japanese technique for creating beautiful thing using coloured paper and folding into attractive shapes. Generally, scissors and other tools are not used in Origami, and hence wastage is reduced or completely eliminated. Thumb printing activity for kids is crucial for developing the brain in early childhood. It not only involves fun but also helps to integrate body and mind with the use of creativity and imagination. You can encourage your kids to take some highly educative activities at home and add to their knowledge. Excellent knowledge of English is vital in all areas of life. Some educational activities for kids at home include reading newspapers, magazines and storybooks. You can assist your child by providing a dictionary and conducting small tests frequently. Gone are those days when kitchen skills were the mainstay of girls. Involve your child in simple tasks in the kitchen such as chopping vegetables or grinding spices. Teach some basic cooking where possible. This is a science activity for kids. Even if you live in an apartment in some high-rise building, gardening is possible. Children can grow decorative and flowering plants in balconies and on window sills. Tending to these plans helps them develop a sense of responsibility. Cataloguing not only is one of the best indoor activity but also helps to keep the stuff at your home systematically. It Involves kids in cataloguing everything that is lying in the house. This is a straightforward exercise. Kids have to find where everything is kept and make a catalogue. The next time you need something, the catalogue will help find it. The system can also be used to keep track of stocks you need to refill such as groceries and household necessities. Group activities help develop team spirit and camaraderie. These are very vital for kids at all stages of life. This physical activity for kids helps your child develop essential life skills in her or his favourite sport by enrolling at a club. If that is not possible, encourage the child to join children in your neighbourhood that can be seen playing some game. Schools usually assign projects. However, you too can entrust your children and their friends for simple and fun projects. This can include a small project to clean up your neighbourhood or a public place. There are many science and math-based projects you can assign children. Performing arts are becoming increasingly popular. A child can attain stardom with some of these art activities. Classes and individual coaches are available for children to master playing their favourite musical instrument. This skill can be further developed into a lucrative profession by playing solo or for bands. Understandably, singing is not for everyone. But kids who aspire to become singers can be encouraged to join classes. Some schools have music classes, but you can enrol your child for one to improve skills. Since India is a land of diverse cultures, there is no shortage of traditional dances in India. Additionally, there are also foreign dances like Salsa,Tango and many more that can be learned at institutes. Dancing is another best activity for kids that can be developed into a profession. Who does not dream of becoming an actor or model? You can give wings to a child’s ambition by encouraging them to participate in dramas and plays held at schools or in your local community events. Acting is a very competitive field, and only those with exceptional skills make it to the top. Picture activities for kids can involve several things. They help a child develop creativity and express emotions. Pencil sketching is a very sophisticated skill that one can learn. There are several classes where sketching skills can be learned. Individual art collectors and companies buy pencil sketches. It can be developed as a skill for a side income. This creative activity is an inborn essential skill in kids. It is one of the best activities for kids since they will happily draw everything from the Sun and Moon to cars and houses. Again, this is the best activity for kids to bring out creativity and express themselves. Indisputably, science activities are essential nowadays. They are needed at all levels of education. Schools have their own science clubs. Additionally, you can find science clubs in your city. Joining them enables you to conduct thrilling experiments and stay abreast with the latest developments in science. It imparts important creative skills that are required for higher education and career in their future. Stargazing is not for people that have nothing else to do. Space exploration is a very major field in India, and the country has several landmark achievements in this field. You can learn about the wonders of the galaxy, planets and stars, comets and meteors through astronomy clubs. Natural history groups study plants and animals in various parts of the country. As a member, you get the opportunity to learn a lot about the rich diversity of India’s flora and fauna and see some rare animals, birds, reptiles and plants, among others. Some of these fun indoor and outdoor fun activities for kids I have mentioned will also be found at schools and colleges. However, you can join external groups and clubs to increase knowledge and skills in the field of interest of your child or self. While formal education for kids is essential, learning some skills through these best activities for kids is equally vital.